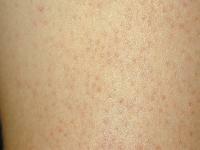 6 pictures of keratosis pilaris... arms, legs, cheek. Keratosis Pilaris Forum - The keratosis pilaris message board community offers you the opportunity to connect online with others. By getting involved in the discussions, you will meet other KP sufferers who understand and share similar experiences. 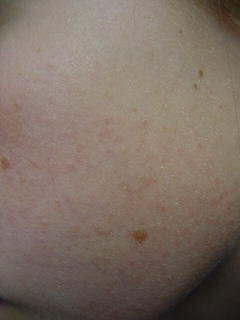 Pictures of Keratosis Pilaris - Images, photos of keratosis pilaris on the arms, legs and face. SkinCare4U - Keratosis Pilaris : A Common Skin Disorder - Articles and KP treatment options. Support Group - Google - Keratosis pilaris group on Google Groups. Support Group - MSN - Keratosis pilaris group on MSN Groups. Support Group - Yahoo - Keratosis pilaris group on Yahoo Groups. Support Newsletter for KP Sufferers Support Newsletter for KP Sufferers - Keratosis pilaris newsletter. 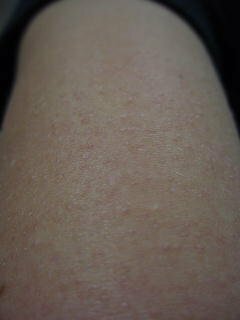 Wikipedia Article - Keratosis Pilaris - Keratosis pilaris tends to occur as excess keratin, a natural protein in the skin, accumulates around hair follicles (process known as hyperkeratinization).... Keratosis pilaris is often confused with acne. 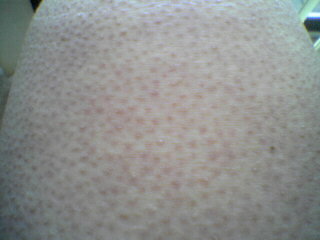 DOIA - Keratosis Pilaris on the upper arm. 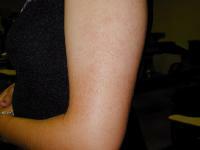 Dr. Mahmoud Hijazy - Typical case of Keratosis Pilaris in the back of the upper arm. American Osteopathic College of Dermatology - Single image of Keratosis Pilaris behind the upper arm.